Just a few days ago, I witnessed several lightnings throughout the entire afternoon. 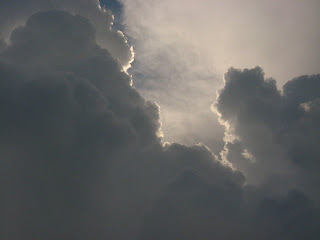 It was like a thread of light from somewhere in the sky among the clouds to the ground with bright light. I don't know exactly where it struck, but I did hear the thunder several seconds after I saw the lightning. It was so loud that I can feel its vibration. I don't know if my house is strong or how long it can last, but it was built just a few years before I was born and moved in it when I was in the first year of primary/elementary school. Thankfully, there are lightning rods on top of almost all buildings and structures in addition to the street lamps along the roads.